Just one year after a complete redesign, the 2014 Sentra sees numerous changes designed to improve the car’s comfort, responsiveness, handling, and technology. The optional NissanConnect system adds Travel Link service and NissanConnect Apps smartphone integration technology this year, and the Sentra’s comfort levels are improved thanks to upgraded seat springs and cushion foam as well as through added sound insulation to make the cabin quieter. A retuned continuously variable transmission (CVT) delivers more lively acceleration and includes a new step-shift program, while the Sentra’s revised electric steering is quicker and more responsive than before. New suspension tuning and thicker anti-roll bars are designed to improve both handling and ride comfort. Four versions of the 2014 Sentra are available: S, SV, SR, and SL. Additionally, the Sentra S and SV can be equipped with FE+ (Fuel Economy Plus) trim designed to maximize fuel economy. In addition to standard equipment, the Sentra SV adds a standard CVT, cruise control, and a better sound system. Plus, the SV model is offered much a broader array of options. The Sentra SR is based on the SV and includes a body kit, fog lights, aluminum wheels, and a rear spoiler. The Sentra SL adds several conveniences including Bluetooth, dual-zone automatic climate control, passive entry with push-button starting, heated outside mirrors, smart automatic headlights, fog lights, and aluminum wheels. This model also has upgraded interior trim, satellite radio, a USB port, and an Easy Fill Tire Alert system. Every 2014 Sentra is equipped with a 130-horsepower, 1.8-liter 4-cylinder engine. In the base Sentra S, a 6-speed manual gearbox is standard; all other versions are equipped with a CVT. If you’re seeking to save money by selecting the Sentra S with the manual transmission, you should know that it is not nearly as fuel efficient as the CVT. With the manual, the Sentra is rated to return 30 mpg in combined driving. With the CVT, the rating rises to 33 mpg. Get a Sentra with the FE+ Package, and the EPA says you ought to expect 34 mpg. According to the National Highway Traffic Safety Administration (NHTSA), the 2014 Sentra receives a 4-star overall crash-test rating. It missed a 5-star rating due to a 4-star protection level for the driver and a 3-star protection level for the front passenger in the frontal-impact test. In crash-tests conducted by the Insurance Institute for Highway Safety (IIHS), the Sentra earned the top rating in all assessments except for the small overlap frontal-impact test, for which the car received a “Poor” rating. 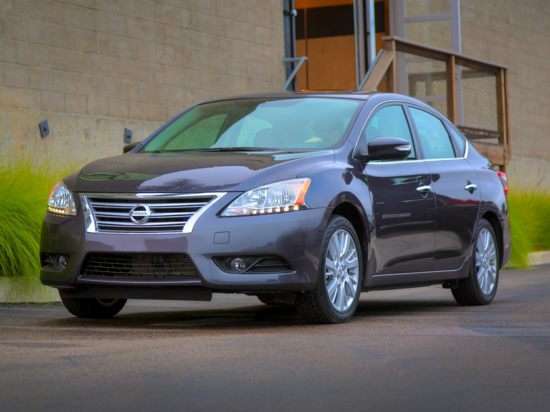 Despite inadequate safety ratings, Nissan has not made changes to the 2014 Sentra in order to address them. The 2014 Nissan Sentra can be optioned with NissanConnect technology, a smartphone pairing system that allows the driver to make and receive phone calls, use a text-messaging assistant, stream music over the stereo system, and interact with social media channels such as Facebook and Twitter.